I had a question recently asking me what I meant when I said I practiced "Hermetic" magic? Well, let's look at the dictionary definition, "(1) made airtight by fusion or sealing. 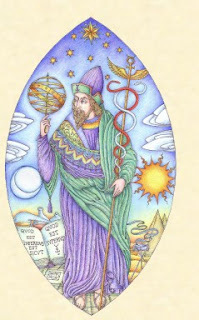 ; (2) not affected by outward influence or power; isolated; (3) of, pertaining to, or characteristic of occult science, especially alchemy; (4) of or pertaining to Hermes Trismegistus or the writings ascribed to him. Origin: 1630–40; Medieval Latin hermeticus of, pertaining to Hermes Trismegistus, equivalent to Latin Herme"
Ok, this actually lays things out really well! As we move from definition (1) up to definition (4) we go back in time from more contemporary definitions back to the original and all the definitions fit nicely together. So the original definition of Hermetic, which is what I mean when I say I practice Hermetic magic, means following the teaching attributed to Hermes Trismegistus, which are the philosophical Hermetica, in particular the Corpus Hermeticum as well as the technical Hermetica, which are practical texts of the Hermetic arts of alchemy, astrology and magic. The earliest written versions that we have of these teachings are circa 1st century AD, but likely are older. Then as we go a bit further forward in time, to definition (3), hermetic has come to mean occult sciences in general, and specifically alchemy. This is the sense in which the 19th century Hermetic Order of the Golden Dawn uses the term hermetic. Similarly, we can understand definition (2) how hermetic could come to be isolated, as the word occult means hidden. Finally, definition (1) the current usage, a hermetic or airtight seal, which comes from practical laboratory alchemy. Very interesting! We have a complete archeology of the term hermetic. By following the etymology of the word, we can understand it more completely. We should also keep in mind that reading and just reading books makes one a dabbler and dilettante in Hermeticism or almost any other practical subject.